Overview: This 8 days Xinjiang Dunhuang, Turpan, Urumqi, Kashgar Silk Road highlights tour bring you to visit natural wonders, Buddhism temples and beautiful Chinese classical architectures and historical ruins as well as the weekly Great Sunday Bazaar, where kaleidoscope of scenes from the pages of A Thousand and One Nights. You are met by our tour guide at the airport and will be escorted to the Hotel. Then start an evening visit to Dunhuang Shazhou Night Market. Shazhou Night Market: It is a night market held on the main thoroughfare, Dong Dajie, in the city centre of Dunhuang, popular with tourists during the summer months. Many souvenir items are sold, including such typical items as jade, jewelry, scrolls, hangings, small sculptures, leather shows puppets, coins, Tibetan horns and Buddha statues. A sizable number of members of China's ethnic minorities engage in business at these markets. A Central Asian dessert or sweet is also sold, consisting of a large, sweet confection made with nuts and dried fruit, sliced into the portion desired by the customer. Mogao Grottoes, housing the ancient thousand buddhas and mural paintings from the 4th to the 14th centuries, are the famous Dunhuang highligh of buddhist art treasures shrine on the north-west Silk Road China.Cameras are not permitted. Echoing-Sand Mountain, Crescent Moon Lake is quite literally an oasis surrounded by sand dues. It is a good place to ride a camel or climb stunning the dunes for spectacular view, 5 kilometers (about three miles) away from the city of Dunhuang. Meet guide at train station and drive 40 minutes to the hotel in Turpan. And then visit Astana Tombs, the Flaming Mountain, Bezklik Grottoes and Local Uyger family in the Vineyard. The Astana Cemetery or Astana Graves is a large site 37 km southeast of present-day Turpan, 6 km from the ancient city of Gaochang. It served mainly as the cemetery for the descendents of Chinese settlers in Gaochang from the 4th century to the first half of the 8th century. The complex covers 10 square kilometres and contains over 1,000 tombs. Due to the arid environment many important artifacts have been well preserved at the tombs, including natural mummies. 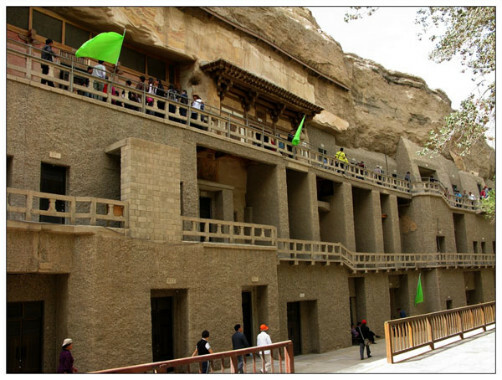 The Bezeklik/Kizil Thousand Buddha Caves: Bezeklik means a place with beautiful decoration. It is famous for ancient murals with exsiting 60 caves, and over 40 caves have ancient murals of 1200 square meters. Pay a morning visit to Jiaohe Ruined city, Karez Irrigation system, Sugong Minaret; Back to Urumqi after lunch in Turpan, then visit Erdaoqiao & International Bazaar. Jiaohe Ruins, is an archaeological site with the largest, oldest, and best preserved city gates, streets and lanes, government office, temples, domestic houses, cave houses, wells, and an underground temple, showing it as an important stop on the Ancient Silk Road. Karez Irrigation System, made up of vertical wells, underground channels, ground canals and small reservois, is one of China's three greatest feats of ancient engineering of underground irrigation channel, along with the Great Wall and the Grand Canal. Visit Xinjiang Museum, Heavenly Lake with a boat cruise. Then you will take the afternoon flight around 17:00 to Kashgar and will be picked up to check in the hotel upon your arrival. Xinjiang Museum is the main institution to collect and investigate the unearthed cultural relics and specimens in Xinjiang. There are more than 50 thousand pieces of various kinds of cultural relics stored in the museum, among them, the ancient mummies represented by ‘the Loulan Beauty', manuscripts in Chinese, Kharosthi, Qiuci, Yanji, Tibetan, Uigurian and other characters prevailed in ancient Westen Regions, the silk ,wool, cotton and hemp fabrics and folk rainment, etc., are unusual tidbits in the world. After breakfast take the drive to visit the Karakul Lake and enjoy the Pamir landscape. The Karakul Lake is a paradise of bonfire night parties for boy and girl khalkhas with tourists. The party is full of ethnic songs and dances, as well as good smell of roast lamb skewers. The Id Kah Mosque is located on the central square in Kashgar City, Xinjiang Uigur Autonomous Region. As the biggest mosque in China, it is a group of old Islamic constructions with strong ethnic style and religious features. Kashgar Old Town is the best place to see how the local Uyghur ethnic group has lived for centuries. The old town district has a history of over 2,000 years. After breakfast you will be escorted to the airport for your next destination by air.